Chris Evans, who stars as Captain America, has put in a lot of time in the gym. He had to be in caliber shape for the shirtless scenes that define his character. The Chris Evans workout is a combination of plyometric circuit training, strength training and abs as a cool-down. On Monday we would do a circuit, then back & arms: a lot of big deadlifting, shrugging, the usual bicep curls. On Tuesday I would do a little bit of cardio and abs. On Wednesday we’d do a circuit then heavy, heavy legs. On Thursday, cardio with some abs. On Friday, a circuit then chest, arms and shoulders. Saturday would normally be a rest day and then Sunday would be what I call a “catch-up day”, if something hasn’t been fatigued, or needs working, or is looking a bit out of place. Chris Evans’ workout starts with plyometric circuit training. This is where you do 4-5 exercises in a row, without rest. This gets your heart pumping, so that you’re in the fat-burning zone while strength training. Then, for the strength training, Chris Evans does 4 sets of each exercise, 10-12 reps per exercise. He then finishes by doing either abs, or stretching, as a cool-down. The plyometrics are done as a cardio/ warm up routine. This is so Chris Evans maintains a fat-burning heart rate throughout the workout. The Monday workout also includes deadlifting, shrugging and bicep curls. Perform the plyometric cardio workout in circuit format. That means do 1 set of each exercise without rest, then repeat the entire circuit 2 more times. Do 8 reps of each exercise, then move onto the next exercise. As you do the squat thrust, do the pushup while you’re on the ground, then stand back up to finish the circuit. 8 reps each / 3 sets: Rest one minute once you complete a circuit. Then complete the circuit–one set of each exercise– again. Dips with 20 or 30 kilos dangling between your legs. Press-ups with a 25-kilo plate on your back. Those types of exercises are very simple but once the body starts to adapt to it the gains you get are just phenomenal. For the weighted dips, Simon Waterson says to start with just your bodyweight. Make sure you can do all the sets with your elbows reaching 90 degrees. Then, you can start adding weight to make the exercise more challenging. I wasn’t concentrating on him throwing the shield to be honest, but conditioning-wise within that routine there was what you would call medial and lateral rotation – that is basically where you’ve got a pair of dumb-bells out in front of you and you’re retracting them to your sides. Medial rotation is very much for posture, but will benefit you throwing a shield or any other object. Simon Waterson likes his clients to do incline treadmill. This Up-hill Treadmill type of exercise is deceptively easy at first, but gets harder as you go for 45 minutes. We’d warm up and then do some intervals for ten to 15 minutes. Really though the cardio training comes from doing the circuits, which are much, much more effective because you’re working at a much higher heart rate. It’s good to switch up between slower uphill cardio, and speed intervals. Each cardio workout focuses on fat-burning, but does so by utilizing either fast-twitch or slow-twitch muscles. 15 minutes of HIIT (High intensity interval training, or speed intervals) is preferred by most when it comes to fat-burning. But, not everyone has joints that can handle that type of activity on a constant basis. Research shows that it doesn’t matter if you go fast or slow. If you’re going to go slow (uphill treadmill) then make sure to go for a longer period of time. Preparing for Captain America, Chris Evans ramped up his cardio. In the weeks before filming Captain America, he did both exercise routines on his cardio days. 8 reps each / 3 sets: Rest one minute once you complete a circuit. Then, do 2 more circuits. The cardio training that Chris did was fairly standard. I’d maybe add a few sprints in there, just to make sure that his hip flexors were loose and that he was capable and conditioned. What we forget is when we watch the movie, we see the one shot of him running down the street after someone. That shot was done in eight takes: that’s like doing eight 100m sprints right after each other. is this workout in captian america 1 ? Or Captain america 2: winter soldier ? Hey! 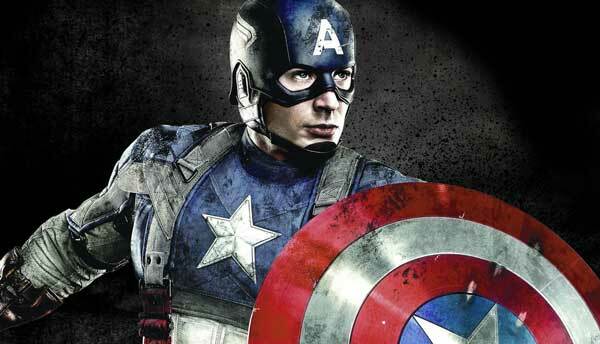 This is for Captain America 2: Winter Solider. Though, he used the same trainer (Simon Waterson) for both. Before that, Chris Evans worked out with Steve Zim. Some of those exercises are included later in the workout. What are the weight amounts that are supposed to be lifted for the exercises? Chris Evans and his trainer never mentioned exactly what weights they used. Since this is circuit training, you want to concentrate more on intensity and form. Start with lighter weights to make sure you have the form down. Once you’ve mastered form, try to get faster (more intense) each week. If it seems too easy, you know you can always increase the weights to make it more challenging. Bulking can be done at this rep range just fine. (Low reps 0-6 is best for strength; 6-10 for bulking; 8-12+ for definition) You still want to use heavy weight. If you’re doing all the reps without a struggle, you definitely want to jump up in weight. Just remember the key to bulking is having the best nutrition. The book I’m currently reading, Nutrient Timing: The Future of Sports Nutrition takes this a step further with the crucial point that: When you consume protein is the key. Making sure you eat protein at the time your body needs it the most will help you the most. The crucial period is during and right after a strength workout. They recommend a drink with 20-26g of highly digestible carbs (glucose, sucrose, maltodextrin) and 5-6g of whey protein before a workout. During the anabolic phase (0-45 mins) post-workout, consume another shake with 40-50g of high glycemic carbs and 13-15g of protein. Have a 3rd shake up to 4 hours after a workout (this time consisting of just whey–or a bit of a casein–without much sugar). When you start consuming protein in the right amounts and at the time, the results will come. Aim for 40-48% carbs, 20-26% protein and 33% fat. 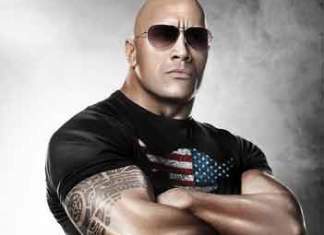 Check out The Rock Workout & Diet for a bigger picture on what kinds of food to eat. You’re doing a great work with all these workout articles. This one is awesome especially. I have a question…i am always reading things online…just like the guy says above (momo), I am also bulking…i really loved your reply. But i am reading so many different Captain America workouts online, is this like the blueprint version? Since you referenced his trainer and stuff..is this close to what he did or just an example? Also, can I do the workout like everyday, five days a week? I sleep alot, and I feel like if i do do back and arms monday, the legs tuesday, the chest and arms again wednesday, the legs again thursday, and then arms and chest friday, I will get great results. But I can stick to this plan too. Finally, how do I deal with my weaker left side? Its very weaaak! Go ahead, tailor the workout plan to your routine/schedule. It’s all about finding what works for you..and then the diet stuff becomes the all-important step from there. #FeedThoseMuscles Also, like Captain America trainer Waterson says, they used Saturday to “work on whatever they felt still needed to be done.” So, use that day how you see fit. No one knows your muscles better than you! When one side of the body is weaker than the other, use DB’s instead of barbells. Although some of your perceived weakness may by psychosomatic, using dumbbells will force your weaker side to improve quickly. It can be confusing with all the information out there. The key is to decide on your goals, and prioritize that aspect. Want to get bigger? Lift first, and finish with cardio. Want to lose weight? Do cardio first and finish with a circuit workout. Of course, most people want to do both: get bigger while losing weight. So, you have to ask yourself if you just want to get big, or if you want a slimmer physique, as well. That's where things get tricky. Read the quotes from Chris Evan's trainer in the article, and you'll see what they did to tackle both aspects. Chris Evans skipped cardio at first, because muscle-building was his primary goal. Then, he realized that he was too big, and didn't look like the superhero he wanted to be. Evans' trainer talks about adding sprints, because there were scenes where he would have to run a lot during the movie. That's when his trainer decided to add the HIIT cardio, and to burn fat by utilizing cardio/metabolic circuits. Remember the key is to use nutrition to help you get where you want to be. Read the above post on how important nutrient timing is to your workout. If you're consuming protein/carbs before and after your workout, you don't have to worry about avoiding cardio. Getting protein and carbs, at the right time, is much more important when it comes to getting bigger. Adding HIIT cardio to your routine can be a major benefit, because of the Afterburn effect. When you use a HIIT workout, the Afterburn effect causes your body to burn calories for up to 24 after working out. That's why you'll see a lot of celebrity trainers using HIIT cardio to get their clients in shape for their movie roles. So do I need to put a rest day between Sunday and Monday if I work some of the same body parts on those days, or is the arm work not too rough on Monday? Chris Evans usually rests on Saturday. On Sunday, his trainer would "fatigue" any part of his body that still needed it. If you do some work on Sunday, it's fine to go ahead with Monday's workout. Just make sure that they're different exercises, rather than repeating a workout twice. It's about balance. You don't want to do the same workout twice. On Sunday, decide which body part needs more work. If it's back/arms, then you'd want to do a different workout the next day. Great Workout! But I had a few questions. I am usually really busy during the daytime (University) so I intend to do most of my working out in the early hours of the morning (4am – 6am) and some extra cardio at night/afternoon (5pm or 7pm). What would I need to change in the diet to accommodate for this? And would I need to change much of the workout for this? No need to change the workout. But, you will have to focus on your diet. The key to muscle building is having protein in your system while you're lifting, and more after the workout. The key book (most recommended by trainers) in this field is "Nutrient Timing" if you're interested in learning more. Make sure that you eat before lifting (something like whey protein and simple carbs). Or, you can research taking BCAA's (The Wolverine's trainer had Hugh Jackman take these). After working out, get a protein shake in within 30 minutes of working out. The goal is to get bigger, so you don't want to waste your efforts by lacking proper nutrition. Good Luck! I've just finished doing the Joe Maganiello workout for 2 months and decided to try something new. My question for this workout is for the weightlifting portion is it done in a circuit or do you complete all 4 sets before moving to the next exercise? Thank you for your help!!! All of this info is greatly appreciated!!! For plyometric circuit training, do one set of each exercise, then move onto the next exercise. The circuit training helps get the blood flowing throughout your entire body. In turn, this helps to burn fat. Of course, fat-burning plyometrics are best done with protein in your system, or you might end up burning muscle, too. For heavy weight training, do all 4 sets of that exercise. For bigger muscles, you always want to do it that way. You want your blood to stay in the region you're training. Chris Evans rests for at least a minute between exercises, before moving onto the next set. You can apply what you've learned about Joe Manganiello's workout, namely the circuit training, to this workout, if you want. It's all about making things your own. The key is in your goals. Do you want to get bigger? Then, stick to the way Chris Evans does it. If you want to get cut like Manganiello, you can turn the entire workout into circuit training. One question, do you know if chris evans took his whey protein with only water? and why he did not eat a lot of carbs if he wanted to gain mass? My guess is that he took a normal protein drink (one of the popular brands). This type would not be just whey protein and water, but rather would include simple sugars. Don't worry about consuming simple sugars right after your workout. Your body isn't likely to turn these sugars to fat. Instead, studies show that whey protein with simple sugars is the best & fastest way to help muscles recover from a workout. 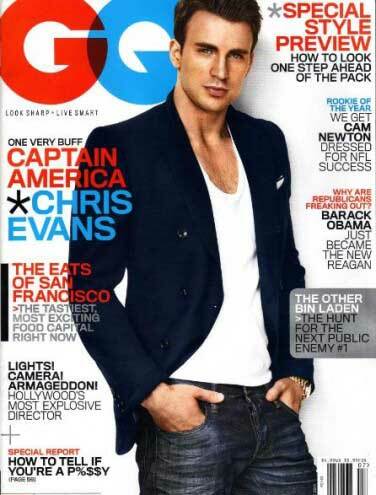 Chris Evans ate a lot of carbs, but did not eat starchy carbs after 2 PM. This is to signal to his body the kind of physique he is looking for. He replenishes his glucose supply in the morning, to keep his metabolism going. In the evening, he's more focused on protein, so that his body doesn't turn excess carbs to fat. uhm, very nice, i want to gain mass, not define. but i think, with this routine i can´t gain much of mass , because he make a lot of cardio a hiit training… Thanks men. Sounds good…You can do this workout with less HIIT if your goal is to gain mass. For this, I suggest The Rock Workout: How Dwayne Johnson Gets His Pump. If you're looking for the best mass-gaining workout routine, that's the way to go. Is there an update in Chris evans’ workout in avengers 2 age of ultron? Also, should i do dropsets, like i am bulking and i dont know how i should be lifting like increase weight after each set or lower weight and drop? I am skinny but i look athletic with almost toned muscles and that is annoying because i am not gaining masss! The key to getting bigger is eating protein/carbs before & after each workout. You can have the best workout in the world, but it’s not going to get you there. The secret is in realizing lifting weights only allows your body (to reach a state where it has the possibility) to transform itself. To actually get bigger, your muscles need protein/carbs readily available. Only with that signal, will your body go into muscle-building mode. Most of the protein shake brands out there have the correct ratio. So, make sure you’re getting that crucial nutrition for bigger muscles. Research shows that 3-4 sets at 8-12 reps is optimal for size gains. So, for dropsets vs. increases, stick with mostly increases in weight. Add in dropsets occasionally when you want to add in some muscle confusion. Thanks for asking for a Chris Evans workout update. I’ll look for the Chris Evans Avengers 2 Age of Ultron workout, and see if there’s one for you! Is this the real actual workout he used? Yes, we get the workouts straight from the trainer. It’s highly likely they switched stuff up from workout to workout. So should all of us. All these exercises were listed by Chris Evans trainer for Captain America. Yeah! Matt, I’ll take a look. I found the official interview from Chris trainer regarding the captain America Workout and I found something different, the circuit training is different it looks like he did more exercices than what you wrote, Rep range is more between 3 sets to 6 to 8 reps with many different angles. The first day is focused only on back traps and arms and no shoulders. A lot of Deadlift…. And for the last day chest shoulders arms, you need to add exercices like median and Lateral rotations. Why my comments doesn’t appear ? Hey Chris! Is this workout safe for teenagers? 2 Upper Body Crunches seem to be the same thing. Can you explain the difference?